3700's were very similar to the 3600's, the main differences being the vestibule cab and a larger tender - usually 8000 gallons. They comprised classes N-2b and N-2c being built right after the N-2a class in the years 1912 to 1914. They were 5,000 lbs heavier - Presumably in part at least, because of the additional weight of the larger cab. Overall measurements were the same as the drawing indicates. 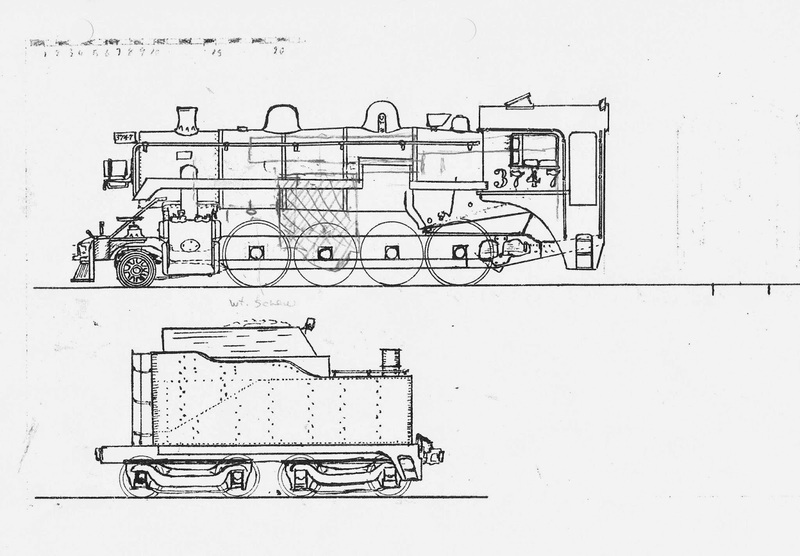 Unfortunately, the drawing does not show the standard 8,000 gallon tender which was more usual for this class. You might also note that the class starts with Number 3691. As mentioned already, several lower numbered 3600's received larger tenders (8,000 gallons) and Vestibule Cabs late in their service life. This model is the cosmetically stock Van Hobbies/Smahongsa edition that was produced in the early 1970's. The only changes made were to replace the gearbox and motor with NWSL equipment and install a decoder and speaker in the tender. 3721 belongs to my friend Dave. It is unfortunate that the manufacturer/importer chose to replicate an unusual model in that the step over the Air Pump is non-standard with its curved running board step rather than being squared as was the case with all 3600's and almost all 3700's. There were few other examples of this running board treatment. One other objectionable feature of this model is the stack with its ugly taper. Fortunately, Miniatures by Eric makes a good replacement. The windows and even the doors should be opened as was the practice of the engine crews in all but the coldest weather. 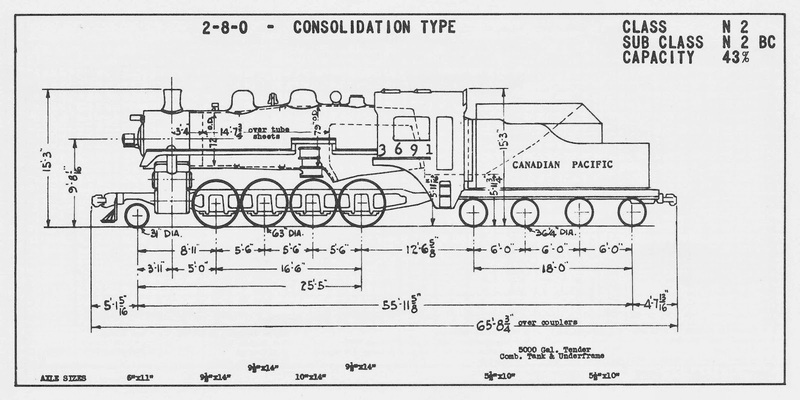 Here is a drawing made by my late friend, Glenn Lawrence, from measurements he took of the prototype 3747 in the 1940's when he prowled the Drake Street Yards in Vancouver. Glenn worked briefly for the CPR in their freight office. Over the years he amassed a huge amount of railway material which he generously shared with anyone who had good reason for it. Unfortunately, his vast collection of material disappeared in his declining years. He was a very good modeler and friend. There is a scale at the top of the page and the drawing is cropped to enable downloading and reproduction to original size. The cross-hatch figure represents the new NWSL gearbox that I added to the model. What is unusual about this locomotive is its tender which has a water capacity of 5,000 gallons. One KV veteran, Tubby Moore, specifically mentioned this detail when I showed him my preliminary model of 3747 which I then proceeded to correct. And here is my final version of CPR 3747 from a Van Hobbies engine. The tender body was modified extensively from the original V H model to produce this 5000 gallon model. In addition to that, the running board step was rebuilt with square corners and the cab doors opened. Of course the ugly stock stack was replaced with one from Miniatures by Eric and a few other details added or modified. Most of these products are available from our favorite hobby shop, Central Hobbies, located in Vancouver BC. Exceptions: cam and wiper (GME direct); pencil lead (sporting goods stores); fuel line (model aircraft stores). Most of the above products could be used for a kit-bashed model such as we discussed in the previous post. Normally I remove the stock boiler weight and install the decoder in the boiler and fill in the space underneath with the fishing line pencil weights and some flat lead sheet in the cab roof. This does cut down on the total weight of the engine by about 5 or 10% but does not seriously affect performance. It is a bit more complicated to install this way than the usual practice of installing it in the tender. I prefer the tender space for a larger speaker enclosure. This produces a much deeper and pleasing chuff and other sounds. None better to my ear. It is a good idea to grind and file smooth the inside of the boiler to clear the decoder. The sound feature was a major influence on my decision to convert my layout to DCC and I am pleased with the results. I chose the Heavy Steam decoder for its whistle selection one of which is very close to the standard CPR whistle on consolidations, mikados and ten wheelers: namely, the Southern Pacific 6-Chime. Hough: Ted Hough (R I P) was a fine modeler and passed to me several sheets of locomotive assignments that appeared to be authentic prototype records. Osborne: R. E. (Bob) Osborne (R I P) was a KV engineman who worked in the years of interest to me. He allowed me to copy out his Engineman's Time Book while visiting with him at Brookmere. Fawcett: Keith Fawcett published an article in Branchline magazine, January 1950 showing assignments for the Pacific Region. Camp: Lance Camp (R I P) passed to me a sheet of KV assignments supplied by an unknown but reliable source. 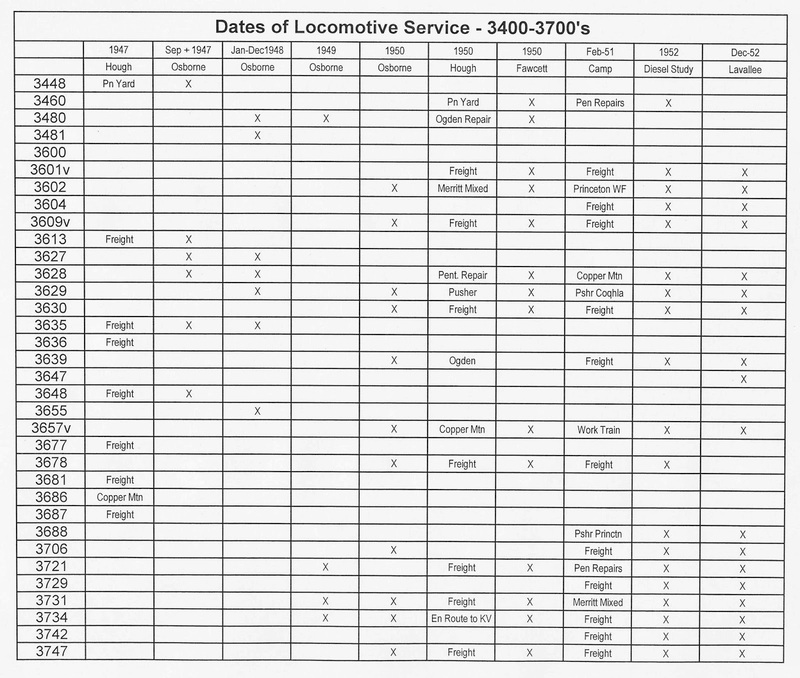 Diesel Study: In 1952, the CPR compiled a list of engines assigned as part of their study for conversion of the southern mainline to diesel power. Lavallee: omer Lavallee published a book on CPR steam locomotives in which tables of assignments were printed for several years. v: 3600 with vestibule cab.